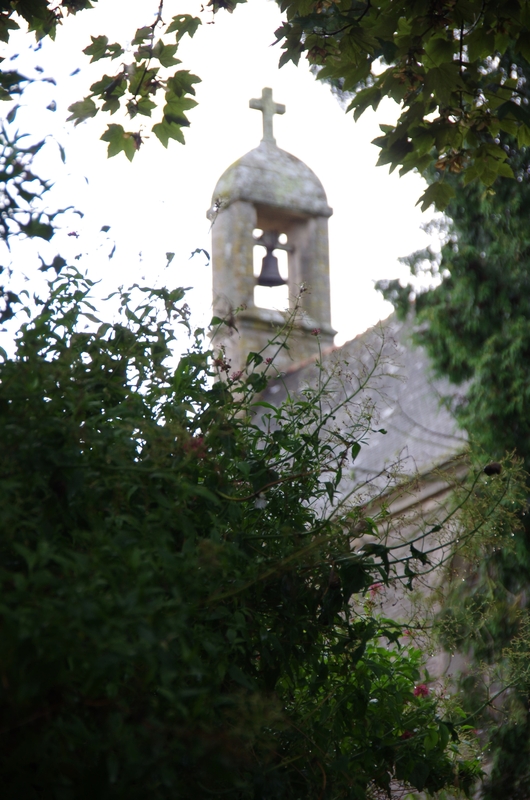 After breakfast and little bit more of being stared at we walk up to the little chapel and its graveyard of Ste-Croix on the other side of the river. Very quaint and quiet. 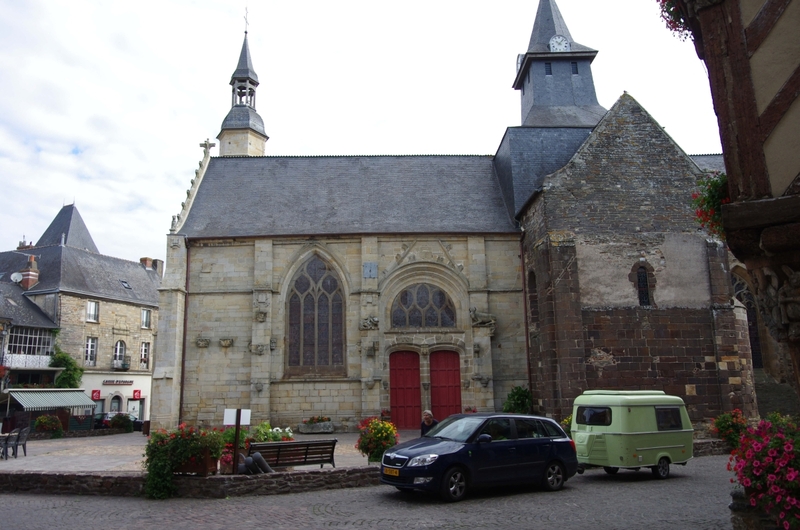 We return to Josselin to find that the castle will only open at 11.00 am today. So back to the market square for some nice french coffee and another match of chess. Again with audience. Back to the castle at 11.00. We are told that they want 28€, but we can only get in at 14.00 hours as that’s the only tour today and they won’t let anybody in on their own. And the tour will be in French. Lost interest immediately. Its just a castle, isn’t it? Instead we seek out the second hand bookshop just down from the market square. It has a very wide choice in English books. Unfortunately it will close down in the next few weeks and everything must go. The child is ready to help and blows the lion share of his pocket money on printed paper. Good boy, much better then on cheap Chinese plastic. Loaded with book we stroll back to the boat and are on the off. The rest of the day is rather uneventful. We start climbing the valley of the Oust in earnest and the looks come now quiet regularly. At the same time they are the only distraction as there are hardly any signs of any civilization all the way to Rohan. 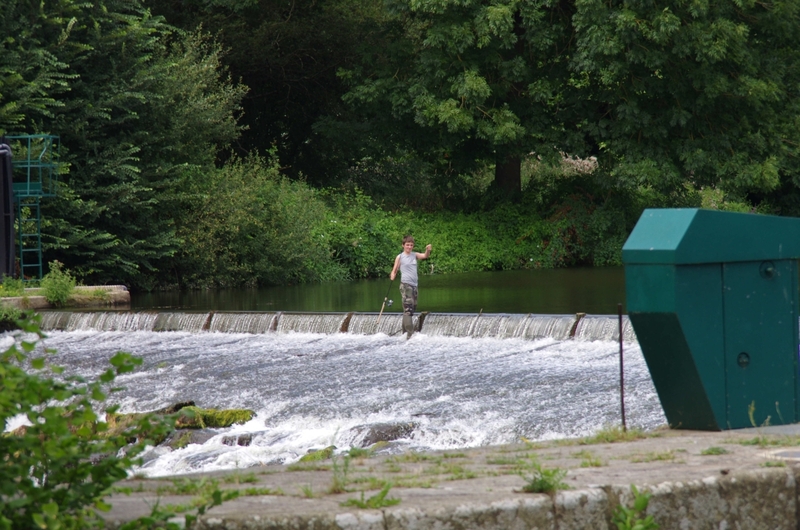 Even the hire boats don’t seem to roam past Josselin and we have the river all to ourselves. 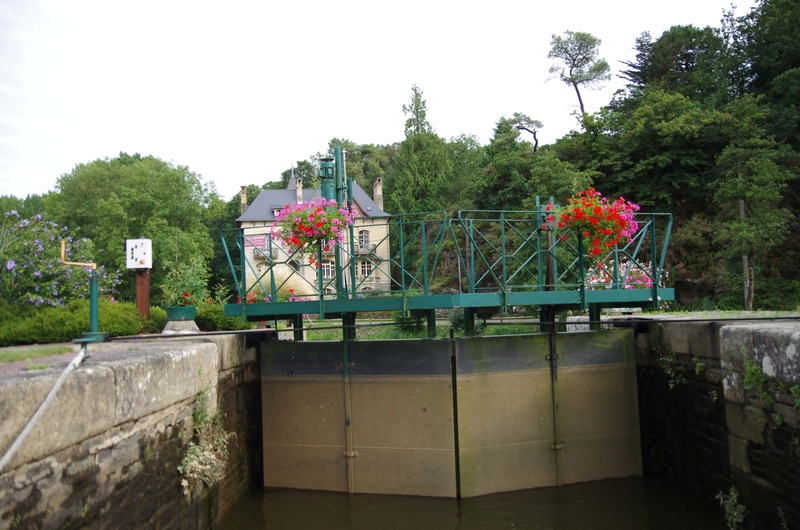 So in case you want to have break away from it all, there are nice bank mooring spot (which are rather rare otherwise) on the straight lock cut above ecluse 41 la Tertraire and above ecluse 43 Cadoret. But we must press on and make the last lock before Rohan just before closing time. There is a little marina just past the village and the camp site, where we planned to stay. But there is a boat moored in the middle of it which is basically a huge floating parrot cage together with the associated racket. Therefore we bank moor outside the marina for some quietness. That’s also limiting the danger of being stared at. Rohan itself is small, quiet, niceish, but nothing you must have seen. There are all the facilities in the marina, a handy supermarket right by the bridge, a good butcher and an even better backer on the market square. We sit out the balmy evening with a BBQ and get mentally prepared for tomorrow, when we will have to climb the summit. After a slow breakfast with fresh baguettes and pain au chocolat we venture into Malestroit to do some sightseeing. 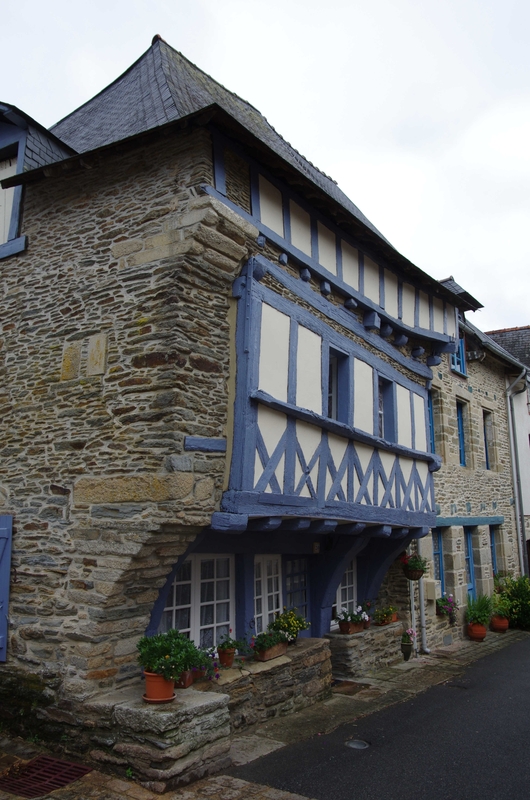 There is nothing really spectacular to see, but its all in all a very pleasant old town with most houses in the center originating from the 16th when locks where built on the Oust between Malestroit and Redon. 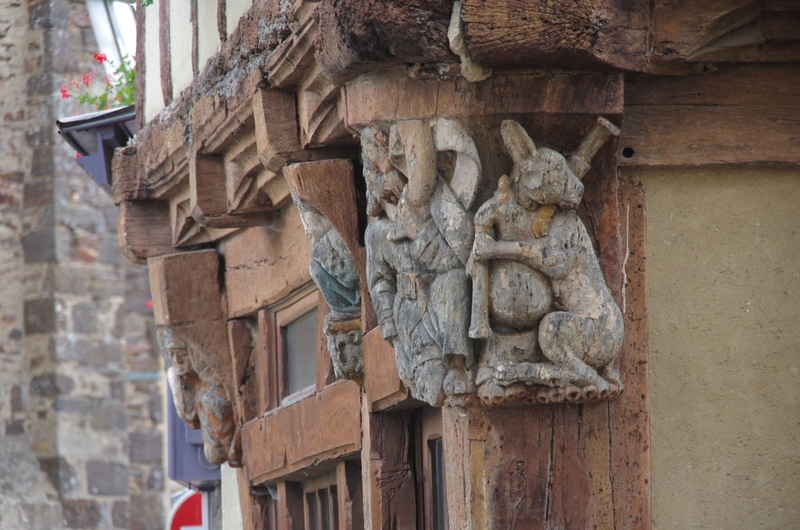 Some of the houses are slate, others half timbered adorned with carvings. In more glorious sunshine we keep navigating upriver making the acquaintance of a quaint little bar tabac in Montertelot that also does ice cream. Picture not showing the bar or the ice cream, as we don’t want to encourage boozing or the eating of too much sweet stuff. 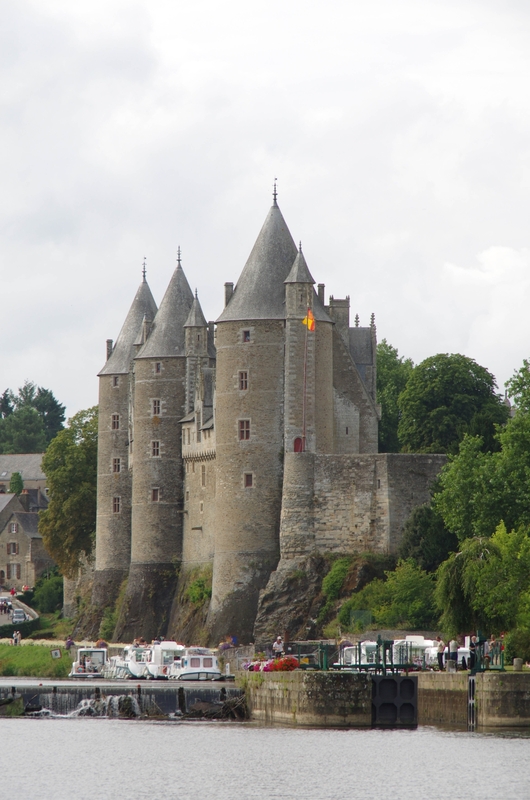 The highlight of the day was supposed to be Josselin with its magnificent castle founded in the 11th century. 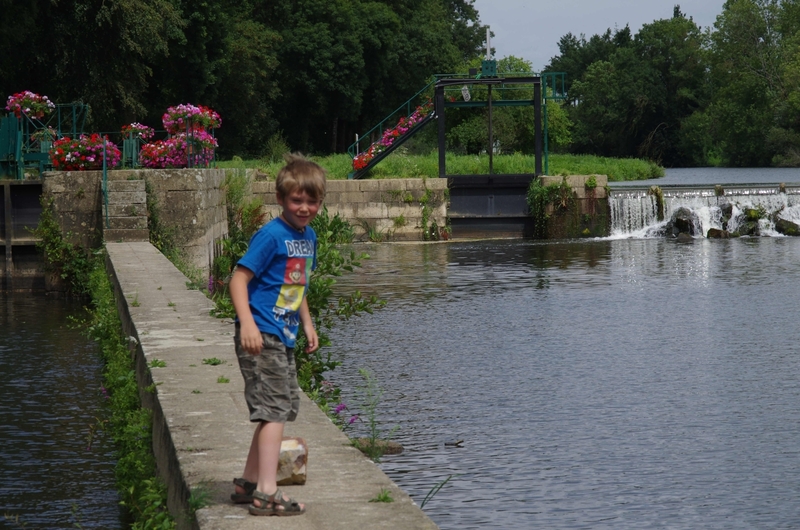 The moorings are very busy with mostly hire boats and we can just squeeze into an Argo-shaped spot below the castle. Here a quiet bizarre situation develops. The private craft behind us is occupied by an elderly couple of two incredibly big obese fat monstrous individuals. Firts the wife takes a plastic chair to the front deck sitting in it and staring at us totally motionless. When she leave the post after an hour or so her husband takes over. And they keep doing that till well after night fall. After dinner we stroll up the hill into town and have a rather nice crepe and noire grande as a desert. There was also a street chess available, and as the child had learned the principles of chess two days before and he wanted to show of to the audience. To my surprise within seconds of the match starting several oldtimers gathered to gongoozle the match. The child was quiet proud.